While visiting the Cleveland area I stayed with my travel buddy, Charlotte, who is a talented artist. Click here to see her website. 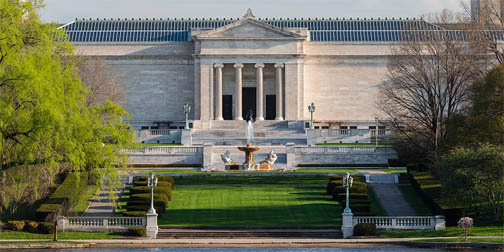 We spent our time together visiting art venues, beginning with the Cleveland Museum of Art. Growing up I spent Saturday mornings taking art classes at the museum so I became very familiar with its collection early on. The museum has since expanded with two major additions and many new acquisitions, and as it was when I grew up, admission is still free. Rare for a major museum! 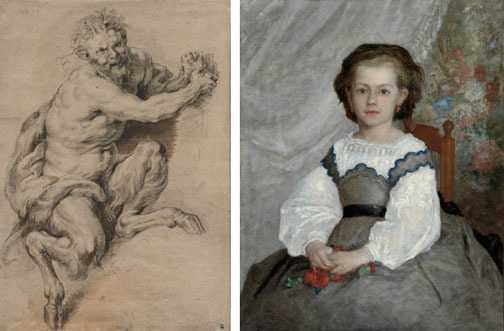 Here are two of my childhood favorites in the collection – a drawing by Rubens and a painting by Renoir. 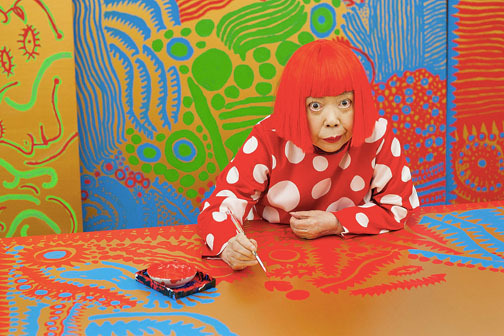 Kusama has had a long career creating very colorful, playful installations. 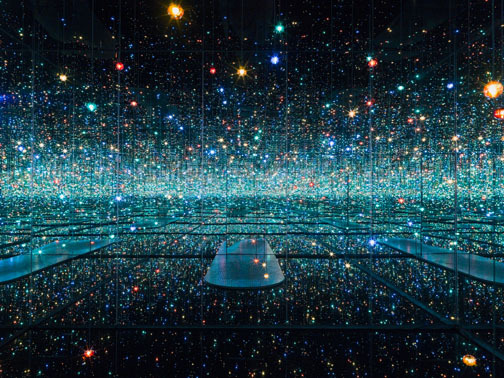 Her latest work combines her signature use of dots with mirrors to create infinity environments. 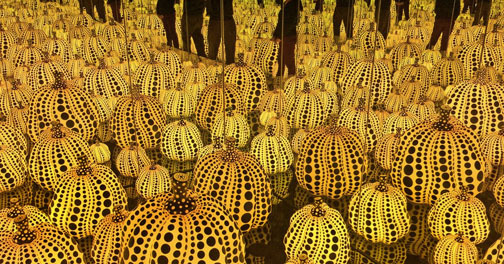 The exhibit in Cleveland is so popular that tickets were sold out and I missed experiencing it. So here are some images from the internet. Charlotte and I visited galleries in several artsy areas of Cleveland and along the way saw lots of Public Art including murals. Cleveland is currently hosting an international art event where artists have been invited to create installations in locations throughout the city. We visited one event created to call attention to the disparity between the way police treat whites and people of color. 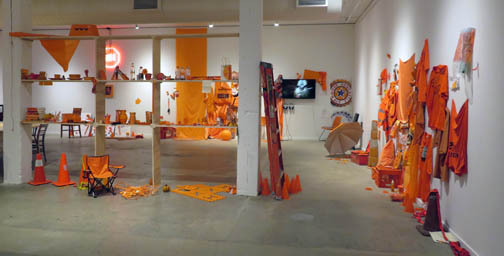 The conceptual installation, A Color Removed, asks “What does it look like when the right to safety is removed?” Orange, the color of safety, is the focus of the participatory event where people are asked to collect and put orange objects from their environment into collection containers placed throughout the city, thus removing symbols of safety. 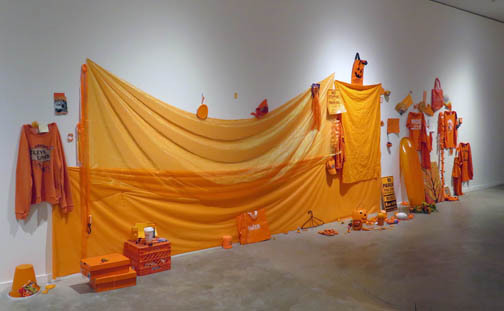 The website explains, The presence of orange, as a symbol of safety, encourages complacency. But what if we could trust that safety is a right guaranteed to everyone who travels in, through, and around Cleveland? What if orange was rendered superfluous? A Color Removed addresses the underlying questions regarding the right to safety by encouraging community members to deconstruct its symbols and create solidarity for a more peaceful city. A Color Removed was conceived by Michael Rakowitz, as a response to the shooting of Tamir Rice by Cleveland police. Tamir was a 12 year old boy shot by police because he was playing with a toy gun that was a replica of a real gun. The gun was an Airsoft gun which had had its orange safety tip removed. The officer who shot the boy was hired by the Cleveland Police without consulting the police department where he had formerly worked. That department concluded that the officer was not suitable for police work because he lacked the emotional stability to be a police office. As we traveled the city, we passed some Cleveland architectural icons. 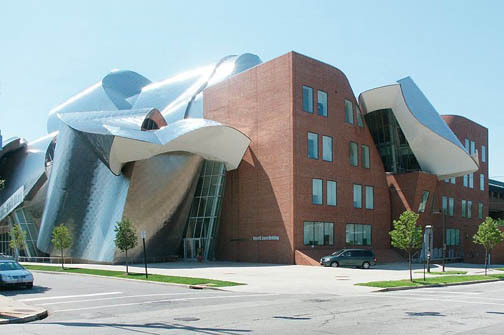 Below is a building designed by Frank Gerhy on the campus of Western Reserve University. 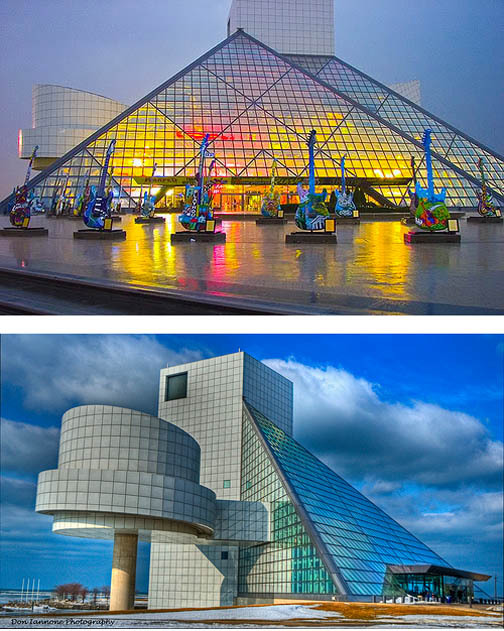 And below are two views of the Rock and Roll Hall of Fame designed by I M Pei, the same architect who designed the pyramid entrance to the Louvre. Cleveland’s history has had its ups and downs. In the late 1800’s, Cleveland became a thriving industrial city with resources of iron ore, copper, lumber and coal arriving by barges on the Great Lakes or by a newly constructed network of rails reaching out through the midwest. Standard Oil was founded in Cleveland and the city became a center for the production of steel and train cars. By 1920, Cleveland was the 5th largest city in the country. Through the generous support of the city’s very wealthy industrialists, cultural institutions such as Severance Hall, home of the Cleveland Symphony, the Cleveland Art Museum, the Natural History Museum, as well as many churches, hospitals, universities were built. Many of these industrialists lived in lavish homes on Euclid Avenue in what became known as Millionaires Row. Sadly, only one of those homes remains today. In the early 20th century, a ring of parks and green spaces were laid out around the city known as the Emerald Necklace, similar to the one in Boston. The downside of the city’s industries was the dirt and pollution it produced. The Cuyahoga River, which runs through the heart of the downtown, once caught fire due to all the chemicals and oil in its waters! Beginning in the 60’s, Cleveland began to go downhill. 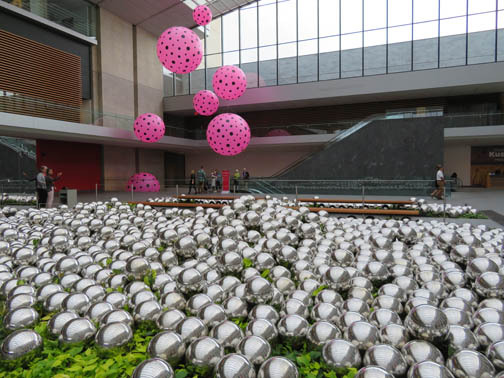 Residents were fleeing to the suburbs and newly built shopping malls while downtown department stores closed. Racial tensions were also rampant in the inner city. In the 1980’s and 90’s the city struggled financially and stagnated. Then with the early years of 21st century, things became to turn around stimulated by the growth of the Cleveland Clinic. The Clinic was located on the edge of a depressed and neglected neighborhood so they were able to buy properties cheaply which allowed the hospital and its research facilities to expand rapidly. The proximity of the Clinic to nearby Western Reserve and Case Tech, the Cleveland Art Museum, the Cleveland Art Institute, and Severance Hall encouraged developers to invest in the area. Now the area, known as University Circle, is completely transformed. Then as factories along the Cuyahoga River closed and anti-pollution regulations were put into effect, the factory buildings and warehouses in the downtown were repurposed as loft residences and trendy restaurants. Now neighborhood sections are being revitalized and Cleveland has become a modern, vibrant city again and a fun place to visit. 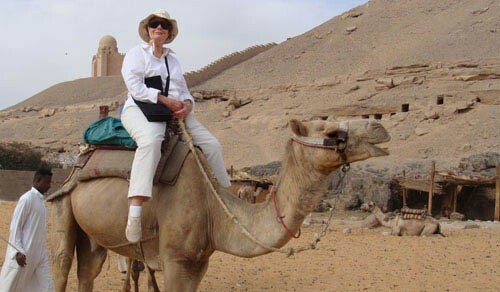 My next post will record my upcoming trip to Israel and Jordan. This entry was posted in Ohio on September 18, 2018 by JWH. I just spent a week visiting friends from high school and college who live where I grew up in northern Ohio. I spent part of the week in Holmes County where the largest concentration of Amish in Ohio live – a population of about 30,000, or half of the 60,000 Amish living in Ohio. The rest of the week I spent in the greater Cleveland area. From the ages of 4 to 6, my family lived in an Amish district in Eastern Ohio and I have fond memories of visiting their farms, playing and picking berries with Amish kids, and joining the families as they collected sap and made maple syrup in their sugar houses and gathered ears of field corn in the fields in late summer. Here I am at the age of 5 with my playmates. I love return visits to Amish districts because the countryside is so scenic and well maintained. The farms are incredibly tidy and clean with manicured yards and gardens with flowers and veggies well tended and thriving without weeds. As I explored the rolling hills, valleys, and winding roads with my friend, Kathy, we did not see one item of litter during our entire stay of three days. The same was true of the towns we visited! The farms have huge barns, silos, and large homes, often for extended families who help with the farm work. Many of the homes had cluster of Martin bird houses. Fields were planted with primarily corn and soybeans. And we saw lots of laundry hung out to dry as well as lots of horse and buggies! We visited Amish bakeries, cheese factories, farm stands and fabric stores where the Amish women get materials for their quilts. A delightful aspect of our visit to the area was staying at the Inn on Honey Run, a hotel situated on a large, beautiful property surrounded by woodlands and fields with trails, sheep pastures, outdoor sculptures, and scenic views across a valley. This is the lodge where the restaurant serves gourmet cuisine. Other accommodations are built into a hillside. For more about the Inn at Honey Run, click here. My visit to Cleveland follows in my next post.